A Section 38 agreement (S38) is a legal agreement between one or more land owner and the council to enable the adoption by us as the local highway authority (LHA) of privately constructed highways under Section 38 of the Highways Act 1980. If a private company has an arrangement with the land owner(s) to develop the land then this developer will also be party to the S38 agreement. An S38 agreement contains clauses which commit land owners, developers and the council to certain duties and responsibilities to ensure that an acceptable standard of highway is adopted. be able to provide HM Land Registry official copy proving freehold title to any and all land to be dedicated as highway. The application process is set out below. Development mitigation measures such as alterations or improvements to the public highway are sometimes required by highway authorities. We may require a developer to carry out highway improvement works within the existing highway network under Section 278 of the Highway Act 1980 or, where it is of strategic importance to that development, works to be dedicated as new highway. The CIL or Section 106 will identify the works required as part of a highway schedule in terms of the works, the powers of the proper officer, any land to be dedicated and the liabilities of the developer. Where dedication of additional land as highway is required an agreement under Section 38 of the Highways Act 1980 may be appended to the CIL or Section 106 agreement or there may be an obligation to enter into an appropriate highway agreement. The CIL or Section 106 including the highway schedule is drafted, negotiated and completed as part of the planning process and the required works are often identified by our Development Control team. A complete set of drawings and calculations is required for the technical approval element of the application, as listed in the technical approval section. The term ‘adoption’ can be used in reference both to the dedication of additional land as highway and the acceptance of alterations to the existing highway. For further information see Section 106 Planning Agreements. The purpose of this drawing is to make clear what is being dedicated as highway. Only areas and drainage which are offered to be adopted under S38 or S278 agreement should be shown in colour. One paper copy of the dedication plan is required for each engrossed copy of the agreement; i.e. one for each of the parties to the agreement excluding the bondsman. A complete set of drawings and calculations is required for the technical submission element of the S38 application, as listed in the technical approval section. Technical approval can only be given once the supervision fee has been paid and the S38 agreement is in place. 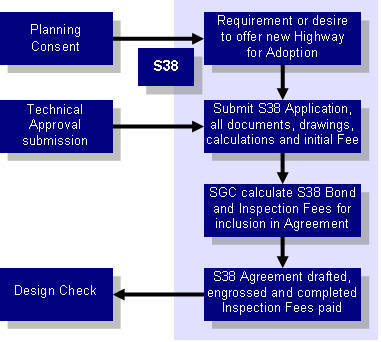 You can download a copy of the S38 highway adoption agreement application form. An example S38 agreement can be downloaded from the list to the right of this page, this example may differ from the version provided in draft form depending on the specifics of the development. S38 agreements prepared by third parties will not be considered. A TRO is the legal document that creates a local traffic rule, each TRO requires road users to obey certain conditions. This can include: waiting restrictions, parking restrictions, speed limits, weight limits and prohibited movements such as no right/left turns, no entry and others. Once the TRO is in place, the police or parking attendants can enforce these restrictions. To check whether an existing order is affected please contact us. Implementing a new TRO is a lengthy process and needs to be identified as early in the design process as possible. On average a timescale of nine months should be allowed for a new TRO to be made. This time is required to undertake consultation with council members and formally advertise the TRO to provide the public with an opportunity to comment. Depending on the comments received the proposals might have to be amended and can even be rejected. Please note that planning approval for a development does not guarantee that the TROs will be made. All TROs need to be sealed prior to the completion of the development. TROs are funded by the developer who is required to pay an initial £5,000 although the cost can vary from £3,000-12,000 depending on the number and complexity. Street names are usually required to process a TRO. Please also refer to the S38 / S106 agreement. The works shall be constructed in compliance with the council’s highway specification and to the satisfaction of the proper officer. If any issue should arise which is not fully covered by the specification or the legal agreement it shall be determined by the proper officer. In the case of a dispute the matter shall be determined by an independent expert at the developer’s expense.